We work with our clients on a contractual basis using the service model, but we are also engaged in project work, are ready to help our Customers to set up or implement quickly or qualitatively one of the key services, and then transfer it to IT support staff specialists. Our specialists work and aware of the best decisions on directions and we offer these solutions to our Customers. 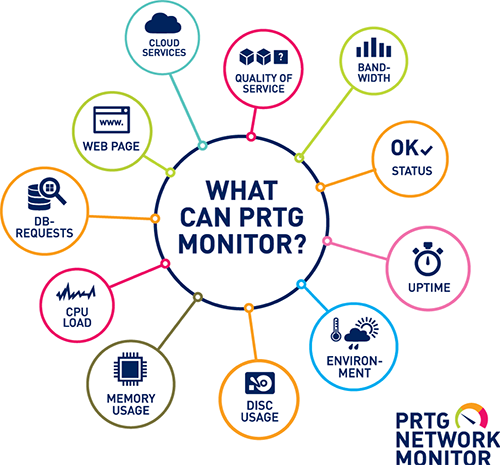 PRTG tracks all your IT systems, devices, applications and traffic. routers, switches, servers, hardware, software, operating systems, applications, virtual environments, websites, mail servers, databases, VoIP and QoS, IPSLA, logos, events, productivity, NetFlow, IPFIX, sFlow, jFlow, SNMP, WMI , temperature, humidity, and many other indicators, with the help of about 200 installed types of sensors. An overview of all the features of PRTG you can find here. Commvault is the market leader in providing innovative, scalable and high performance solutions, which help to manage all data no matter where it is stored: in the customer’s data center, in public or private clouds, or in hybrid environments. Commvault – is the Gartner quadrant leader in back-up technologies for several years already. An overview of all the features you can find here. Microsoft Office 365 is a suite of cloud services and business tools that provides professional work with documents and effective collaboration within the team. It includes technologies for unified communications and cloud – based collaboration – Exchange Online, Skype for Business, SharePoint Online and OneDrive for Business, along with the latest versions of Microsoft Office Standard and Professional Plus. No additional training is required to work with Office 365. These are all the same well – known Microsoft Office applications (Outlook, Word, Excel, PowerPoint) with the ability to install locally, now with additional cloud services. The work of Microsoft Office 365 is supported by powerful, geographically diverse world – class data centers. The service level agreement ensures uninterrupted work during 99.9% of the time for all service plans of Microsoft Office 365. The latest versions of well known classic Office 365 applications allow you to access current versions of files from anywhere. Some tariff plans allow you to install Office on five PCs or Macs and five tablets (on the iPad® or on Windows or Android devices). All Office 365 plans are compatible, so within the framework of one contract, you can buy plans with different layouts. Some Office 365 tariff plans allow you to install on your device the latest versions of local Office applications that give you ability to work with files regardless of Internet connection. You can get information about Office 365 plans from our experts or see by yourself on the Microsoft website using link. Adapted Office 365 options for educational and government agencies, non-profit organizations and for home use are also available. Solutions from Cisco and Fortinet have long been standards of quality and safety and are leaders in the network segment. Despite the wide range of Cisco and Fortinet products, our engineers will help you find the best solution that suits your business. An overview of all products and solutions you can find here and here. IT LEADER LLC. All rights reserved.